Millions of Gmail Passwords Leaked: Was Yours One of Them? 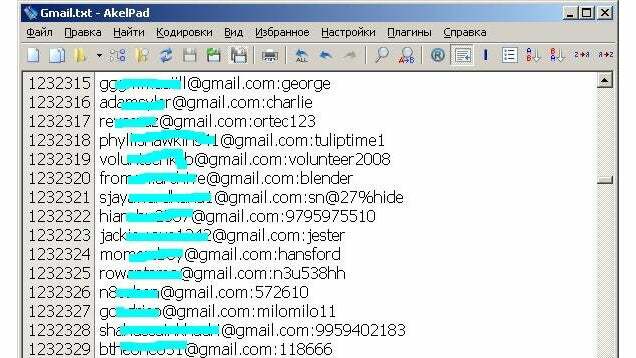 According to the Daily Dot, nearly 5 million usernames and passwords to Gmail accounts have been leaked on a Russian Bitcoin forum. Here’s what you should know. The list has since been taken down, and most sources are saying that lots of the information is quite old—though others are claiming 60% of the passwords are still valid (not to mention really, really horrible). To check if your password was one of the leaked, plug your Gmail address into this tool (which also checks against recent Yandex and Mail.ru leaks). If you’re paranoid, you may also want to change your password at this time. As always, make sure you use a strong password and enable two-factor authentication on your account. Hit the link to read more. According to the above site my gmail account has been hacked……however, when they listed the first 2 characters of my password…….it wasn’t correct! But I guess I’ll go ahead and change it anyways….no big deal to do that! No it was not so why would I want to change it ?? ?